After breakfast 08:30 you drive to the start of the Rongai route a distance of 58 km. It takes about four hours due to the rough road.On arrival at the gate a short rest whilst formality’s are completed.• After about 3 hours hiking you reach the first cave where you have lunch and rest. • Overnight stay near the cave. The hiking starts at 08:30 after breakfast, lunch is served in the second cave, you then continue hiking to the third cave where you will overnight. 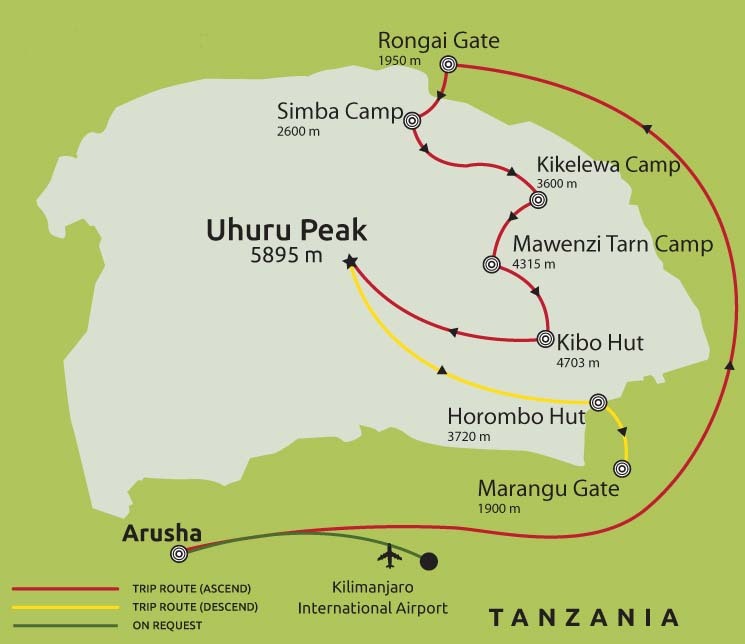 Circa 6-7 hours hiking for this day magnificent views of the Kenyan plains below and Mawenzi tarn above. The hiking begins through the high alpine desert, between Mawenzi and Kibo peaks. lunch is served between School Hut and Kibo Hut • Ultimately you arrive at Kibo Hut and camp over night near Kibo Hut. one should reach Uhuru for the most wonderful of sights, dawn on the Roof of Africa! Leave Horombo at 07:30 and descend to Marangu gate via Mandara Hut. The walk takes circa 5-6 hours. On arrival at the gate you will receive your Certificate of Accomplishment and be taken by our vehicle back to your lodge for a much needed hot shower and rest. Transfer to Kilimanjaro International Airport for those returning home.• For those taking one of our Zanzibar extensions collection/transfer as described in tour description.